Looking for embroidery designs to customize your jeans, shorts, or jackets? We have compiled a list of 5 unique embroidery design sets that you can use on your old jeans, pants, jackets etc. and give it a new, fresh look. You can also customize your new jeans too and personalize them to your heart’s content. Check out these unique embroidery designs below. Floral Music Notes set is digitized by designer “Ace Points.” This set features 10 unique floral embroidery designs. These work perfectly to revive old jeans. Just stitch them anywhere on your jeans and get ready to flaunt your new style. These music designs are available in three different hoop sizes including 4 x 4, 5 x 5, and 6 x 6. Floral Golden Glow set is digitized by designer “Threads Of Time.” These pretty one color embroidery designs are shown here in golden color threads, you can use any colors you wish. You can use these designs for any of your projects. They look especially great on jeans. This set features 10 unique embroidery patterns, available in the hoop sizes of 4 x 4 and 5 x 7. Decorative Dolphins set is digitized by designer “Erina’s Designs.” This set features 6 unique dolphin designs. You can add them on your jeans, cushion covers, towels, and more. These designs feature lots of decorative details. This set is available in the hoop size of 5 x 7. Tattoo Jeans set is digitized by designer “Creations By Kara.” This set features 12 unique embroidery patterns with project instructions on how to take your jeans and make them into new fabulous and fashionable creations. These design sizes vary from the smallest design 86 mm x 74 mm to the largest design 112 mm x 316 mm. Yin Yang In Damask set is digitized by designer “All stitch.” These designs stitches out beautifully and easily. This set features a truly versatile collection that can be used for towels, linens, decor items, table clothes, and more. This Yin Yang set has 20 beautiful designs, available in the hoop size of 5 x 7. Looking for more embroidery designs ? There are THOUSANDS of them at OPW. Visit The OPW Mall – where YOU are always #1! 3D Christmas Dragon Ball set is digitized by designer “Oriental Embroidery.” This ball is perfect for home decoration. This set is available in 8 different formats and fits the hoop size of 5×7. You’ll also get a PDF tutorial along with this set. Tree Ornaments set is digitized by designer “Enigma Embroidery.” These beautiful ornaments are easy to sew and quick to make. You can use these embroidery designs to decorate any corner of your home (and your tree, of course). This set features 12 unique embroidery designs that fits the hoop size of 4×4. FSL Bow And Red Hat Bowls set is digitized by designer “Artistic Designs.” These bowls are perfect to decorate tables at your home or to give as a gift to your red hat friends. You also get a bowl decorated with FSL bows, great for Christmas or any occassision. You can use these bowls to store candies, potpourri and any small items. This set is available in the hoop size of 4×4. ITH Butterfly Dreams Sq Tissue Box Cover set is digitized by designer “JHB Creations.” This tissue box cover is made ‘In-The-Hoop’ and fits the hoop size of 5×7. You can use this beautiful, decorative tissue box to store tissues in your home and workplace or to give as gifts. 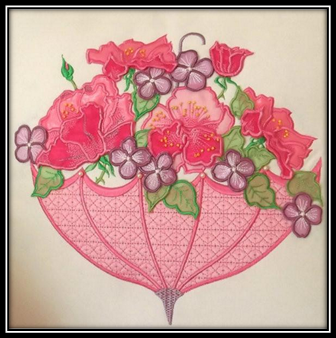 3D Roses And Umbrella set is digitized by designer “Enchanting Designs.” These embroidery designs are perfect for cushion covers, wall hangings, table covers, and more. This set is available in two different hoop sizes 5×7 and 6×10. If you loved reading about and viewing these beautiful designs, share this page with your friends. For more fantastic embroidery designs, visit The OPW Mall – where YOU are always #1. As Thanksgiving is almost here, have you started planning your Thanksgiving celebration yest and how you will be decorating your home? Surprise your friends and family this year by creating beautiful projects with unique embroidery designs on them. Here are 5 new embroidery ideas to beautify your home or to give as hostess gifts for the Thanksgiving occasion. Thanksgiving Mylar With Project set is digitized by designer “Sewaz Designs.” It features beautiful autumn designs including 4 leaves, a cornucopia, and pumpkin basket. They are perfect for Thanksgiving decorations, fast and easy to stitch out. The leaf designs are available in the hoop size of 4×4, cornucopia in 5×7, and pumpkin basket in 6×10 hoop size. This set also includes instructions to create the table topper and table runner. Thankful Bunting set is digitized by designer “Embroidershoppe.” You can hang a THANKFUL above the fireplace, at your front door or any place you want to welcome guests with love and warmth into your home during this time of gratitude. This ‘in-the-hoop’ project is done in the 5x 7 hoop. It is easy to stitch and will catch everybody’s attention. Happy Thanksgiving set is digitized by designer “Sweet Heirloom Embroidery.” This set features 16 unique Thanksgiving embroidery designs. They are perfect for decorating you’re the kitchen, living room, dining room and more etc. during Thanksgiving. Done in a color linework technique, they stitch up very quickly and give a vintage appeal to your table settings. This set is available in three different hoop sizes including 4×4, 5×5, and 6×6. Thanksgiving Collection set is digitized by designer “Babynucci Embroidery Designs.” This darling set features 10 unique embroidery designs in a colorful, fun look. You can use these designs for your kid’s clothes and to decorate their room too. These 10 unique designs are available in different hoop sizes including 4×4 and 5×7. Give Thanks set is digitized by designer “Wind Bell Embroidery.” The set features 10 unique embroidery designs. It will help you to get ready for the holiday. These designs are perfect for wall hangings, cushion covers, and wall paintings, kitchen towels, pot holders, placemats, aprons, etc. This collection is available in two different hoop sizes including 4×4 and 5×5. We wish you a very happy upcoming Thanksgiving and Christmas holiday! For more designs, you can visit The OPW Mall – where YOU are always #1. Everyone loves a beautifully decorated room and kids are no different. So, this time we have some cute and playful puppy embroidery designs that you can use to decorate your kid’s room. You can add these designs to pillows, towels and quilts to give a cute and playful look to your child’s room. Or make unique, fun toys! Loavable Puppy set is digitized by designer “Projects By I Mutz.” These embroidery designs are fun and easy to create. This ‘puppy’ project is done in three hoopings. Arms and legs of puppy are done in 1st hooping, ears in 2nd hooping, and body and assembly in 3rd The ‘Loavable Puppy’ embroidery project is available in the hoop size of 8×12. Mom And Me Puppy set is digitized by designer “Daffy Down Dilly.” This cute set includes 10 different embroidery designs and all of them fit the hoop size of 4×4. The average size of the designs is 3 (13/16) x 3 (7/16). These are perfect for quilts and nursery items. Colonial Girl and Puppy set is digitized by designer “Aunt Martha’s Embroidery.” This design is fast and easy to sew. You can sew it on your tea towels, cushions, pillow covers, kid’s quilts, bed sheets, and more. The design is available in the hoop size of 5×7. Spring Puppy set is digitized by designer “Ace Points.” This set features 10 unique embroidery designs. These are perfect for kid’s décor, clothes, and more. They are available in two different hoop sizes including 4×4 and 5×5. Puppy Fun set is digitized by designer “Hatched In Africa.” This set features 16 unique and cute embroidery designs. These are perfect for baby quilts, burp cloths, cot bumpers and so much more. These designs are easily available in the hoop size of 5×7. Did you like our assortment of puppy embroidery designs? Share your thoughts with us in the comments below! For more ideas and designs, visit The OPW Mall – where YOU are always #1. Fathersday set is digitized by designer “Allstitch.” These designs are great to create something memorable for your Father. You can even embroider a message for your beloved Father to make his day even more special. These embroidery designs are available in the hoop size of 5×7. Dads Gift set is digitized by designer “Always J Designs.” This set contains 4 unique embroidery designs for coasters and 2 for aprons to fit the hoop size of 5×7. What a special and useful gift for Dad! Golf Mug Rug set is digitized by designer “Oma’s Place.” This machine embroidery design is great for birthdays and Father’s Day gifts. The side borders are applied with the “stitch and flip method” and the center is quilted with a geometric pattern. It is a completely in the hoop project, with no additional hand or machine sewing required. This set is available in the hoop size of 5×7. 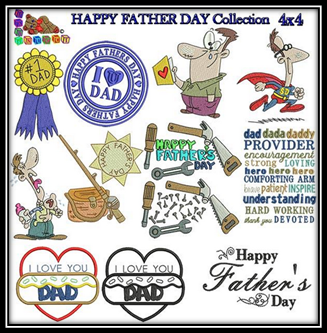 Happy Fathers Day Collection is digitized by designer “Babynucci Embroidery Designs.” These embroidery designs are perfect for any Father’s day gift item. You get many various designs that can be added to dish towels, apron, or any other thing to make him feel proud. These designs are available in the hoop size of 4×4. Father Day set is digitized by designer “Sew-Sensational Designs.” We are sure your Father will love it when you create a perfect gift for him with these designs. They are great on t-shirts, kitchen towels, aprons, and more. The Father Day designs are available in the hoop size of 4×4. For more amazing embroidery designs, visit The OPW Mall – Where your dreams become a reality, one stitch at a time! Getting babies to eat can get messy! Baby bibs are the best solution to keep food off your baby’s clothing during meal time. They are available in various sizes, shapes, and materials. Now, with your embroidery machine, you can create baby bibs for gifts and home use. Check out these 5 cute embroidery design sets of baby bibs you can create. Applique Critter Bibs Large and Small set is digitized by designer “Ovistin In Africa Creations By Martha.” This applique baby bibs embroidery design set comes in 2 different sizes – large (8×12 hoop size) and small (8×10 hoop size). You can use large baby bibs for babies that are 6-12 months old and small ones for new born babies. Lil Lady Bib In The Hoop set is digitized by designer “Oma’s Place.” This in the hoop drool bib is fast and fun to make. You can combine it with some other ‘in the hoop’ baby designs to create baby shower gift sets. These ‘lady bib’ designs are available in two different versions, one with the lady bugs and the words Lil Lady, and another one without the words and design. They are available in two different hoop sizes 6×10 and 7×11. NNC ITH Fish Bib set is digitized by designer “NonnieNoo Creations.” It is done entirely in the hoop for the 8×12 hoop size (200 x 300mm). Your baby will love wearing their fancy bib. You’ll also get a complete step by step photo instructions in the PDF format along with this set. Bear Bib And Holder set is digitized by designer “Crafty Crow Creations.” The holder will keep the teething ring clean once it is pulled back into the pocket. The ‘bib and holder’ set is perfect in any color. Step by step instructions are included. These designs are available in the hoop size of 5×7. Interchangeable Baby Bibs set is digitized by designer “Stitch Delight.” These embroidery designs are available in three hoop sizes including 5×7, 6×8 and 7×8. 5×7 hoop will yield a finished bib of 6×8.5 inch, 6×8 hoop will yield a finished bib of 7.14×10.20 inch, and 7×8 hoop will yield a finished bib of 8×11.37 inch. The bib is kept blank so that you can add all those booboo blocks, or pretty fabric, or stitch a design on any fabric and then add to the bib. This set also includes full instructions to create this project. Ensure to share images of your project with us in the comment section below. For more embroidery designs and new ideas, you can visit The OPW Mall – Where your dreams become a reality, one stitch at a time!